Among its recent Twitter gems: “Drew Faust Asks All 22,000 Harvard Students to Endorse Her ‘Leadership’ Skill on LinkedIn,” after her retirement announcement, and a shot of Facebook’s CEO at Commencement (a twofer: the honorand, and the College’s general-education program). Worthwhile features have included “Résumé Absolutely Cannot Fit Onto Less Than Four Pages, Freshman Informs Adviser” (“Did I fund an entire orphanage in rural Estonia to fill ONE PAGE?” asks the irate advisee) and “Entire History of Race and Gender in the United States Covered in 4-5 Page Final Paper” (“Even though she banged out her essay in a night, Parsons apparently managed to contextualize slavery, the Civil War, Reconstruction, female suffrage, women’s roles in World War II, the Civil Rights era, all three waves of feminist thought, police brutality, and the 2016 election in just under 2,000 words”). Beyond pompous peers and the president, frequent targets include director of University Health Services Paul J. Barreira, executive vice president Katie Lapp, and College dean Rakesh Khurana—at least one of whom is a confessed, amused reader. Way to go, Satirists. Primus often steals good bits from the Memorial Minutes presented to the Faculty of Arts and Sciences: 1,000-word celebrations of the intellect and personality of a deceased colleague. On occasion, a Minute serves other purposes as well. Gordon McKay professor of computer science Harry R. Lewis chaired the committee that memorialized Paul C. Martin, Van Vleck professor of pure and applied physics and dean of the then-division of engineering and applied sciences, presented on May 2. During the year, Lewis sharply criticized the College’s proposed sanctioning of membership in final clubs; his Minute managed to play off both his subject’s love of the place (“Martin once told a colleague that he had ‘Harvard tattooed on [his] chest,’ which was not far from the truth”) and how he, in Lewis’s interpretation, helped lead it (“In Paul’s Harvard…[c]ommittees existed not to ratify predetermined conclusions but to develop recommendations that would survive logical and ethical scrutiny”). Politics aside, in purely human terms, “Paul’s unfathomably deep devotion to Harvard’s interests explained his legendary frugality. To spend a dollar of Harvard’s money was to make a moral decision. Paul’s assistant did not have assistants of her own, and a faculty lunch was one to which faculty brought their own sandwiches.” Come to think of it, those last details, in refined Memorial Minute rhetoric, are political, too—directed with equal sting in all directions. This older image of Memorial Hall shows one of the four clock faces that adorned the tower at the time of the fire. Smoke billowed from the top of the tower at 4:29 p.m., followed by sheets of flame. The tower’s copper sheeting and ironwork had been donated for scrap during World War II; restoration work was almost complete (note the scaffolding in the image above) when the fire broke out, possibly caused by an unattended blowtorch. When Cambridge firemen rushed equipment up the long, perilous stairs inside the tower, they found the belfry aflame. “The clocks were gone.” In the aftermath, “all that remained were the tower base with its parapet, turrets, gargoyles, smoldering timbers, and great bell—cracked and ruined by the flames—and the metal staging that had temporarily encased the tower,” wrote Henry G. Pearson in “The Missing Tower,” in this magazine’s May-June 1988 issue—part of an alumni effort to persuade the University to restore Memorial Hall’s crowning glory. 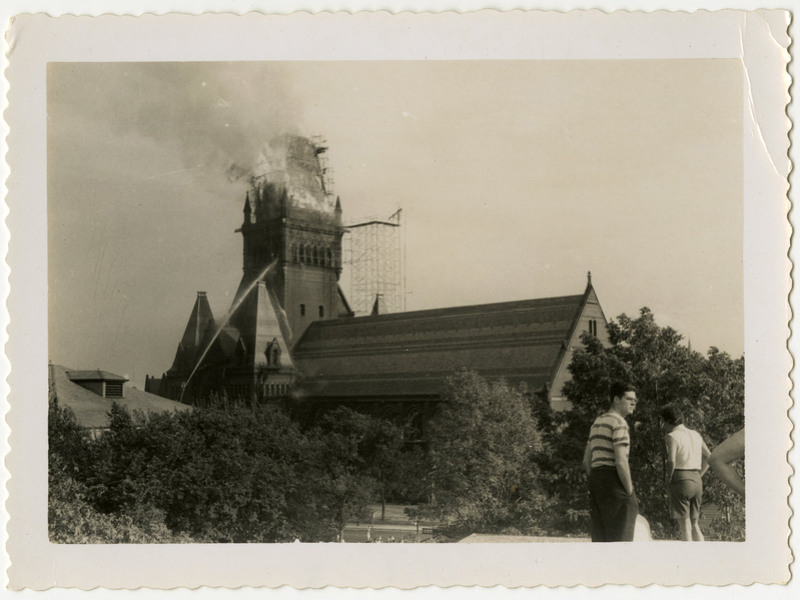 On September 6, 1956, a fire destroyed Memorial Hall’s clock tower; a color photograph captured the conflagration (see harvardmag.com/memhall-99). William Simon, Ph.D. ’58, an emeritus professor at the University of Rochester Medical Center, and a fellow graduate student photographed the destruction. He recently published the images online, reporting that, as shown, firefighters “did not have enough pressure to reach the top of the tower,” so “The clocks were gone.” A thousand feet from the flames, “we could feel the heat on our faces.” Simon conveyed the images to the magazine; we have deposited them at the University Archives.